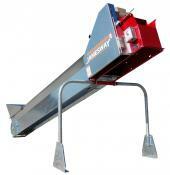 14” belt feeders for single or divided lot operations. 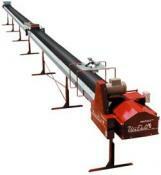 18” belt feeders for multi-lot operations. Direct drive gearbox reduces maintenance. Exclusive Jamesway chain system eliminates the constant adjustment required by cable drive systems. 2-1/2’, 5’ and 10’ 16 gauge galvanized steel sections available. 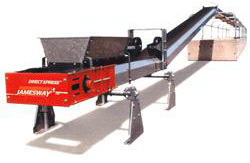 High capacity 16” wide belt conveys any type of forage, ground feed or TMR at high speed and low horsepower up to 180 feet. Smooth belts are available for up to 15 degree inclines. Textured belts are available for up to 30 degree inclines. 10, 5 or 2.5 ft sections with extra wide galvanized splices. Incline or decline sections available.